Not your average teeny tiny lapel pin! This gorgeous metal and enamal CUSTOM pin measures 1 1/4" x 1 1/4" and is engraved with SCPBT motto and website on the back. 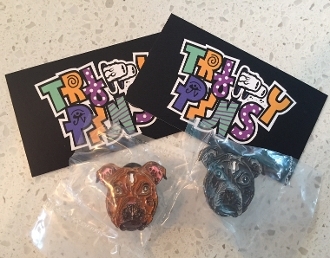 Wear your pitbull loving flair! Available in "red nose" (red) or "blue nose" (gray).